I won this book in a giveaway on Twitter and I was so pleased. I love Jen Williams’ Copper Cat trilogy, and couldn’t wait to get stuck into her new series. Luckily I wasn’t disappointed. As with her last series the story centres around a trio of misfit adventurers; Lady Vincenza ‘Vintage’ De Grazon, Tormalin the Oathless and Fell-Noon. These three odd fellows are drawn together into a tangle of conspiracy and war, complete with magic and chaos. An enemy thought long gone may rise again if they can’t bring back a dead god and save the world. Williams is a fantastic writer, she doesn’t sacrifice characters for plot or vice versa, which is often a struggle in fantasy writing. Her world building is consistent and highly imaginative. I got Miyazaki vibes from the creepy Behemoths and there’s an element of Norse mythology in the Eboran god, all of which I loved. I honestly cannot wait for the next book. 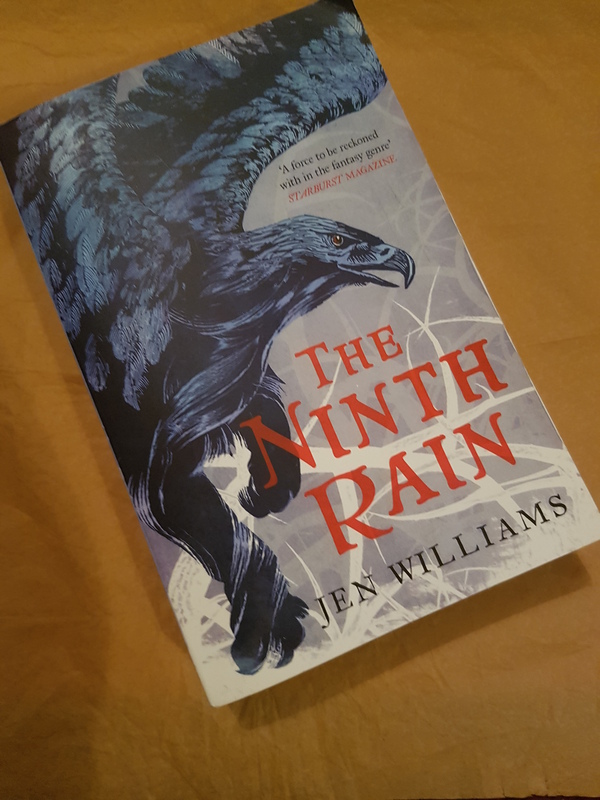 The Ninth Rain is out now.